You are here: Home › Competition › Considering Choreography? 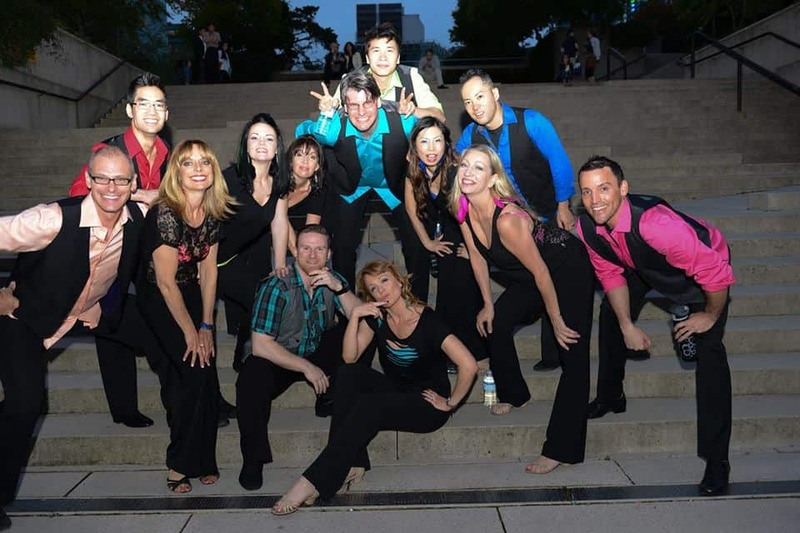 The West Coast Swing world is a strong supporter of social dancing: the improvisation side of the dance. The idea of speaking a language in order to carry on a conversation with anyone in the world without planning, is of the highest value. However, almost all dance forms have a facet to them that involves a planned sequence of moves choreographed to a specific piece of music. The joy is derived not from the spontaneity and discourse, but instead from the precision and expression of executing movements exactly, beautifully, and naturally. There is no doubt that dancers who do routines enjoy a boost in their skill level, status, and passion for the dance. By assigning specific movements to accents in the music, your brain tunes itself to hearing subtleties and instruments it used to ignore. By linking together new patterns and movements, you brain develops new neural pathways that are easily accessed next time you are doing a similar activity. You gain more material to use in social dancing. By forcing yourself to move a certain way, on precise timing, to hit a break or a line, you activate the muscles necessary to control that movement as you desire. You gain more balance, body awareness and body control. By exploring unique movements to hit accents like footwork or stylings from other dances, you are introduced to a new vocabulary of movement which will worm its way into your social dancing and blossom. 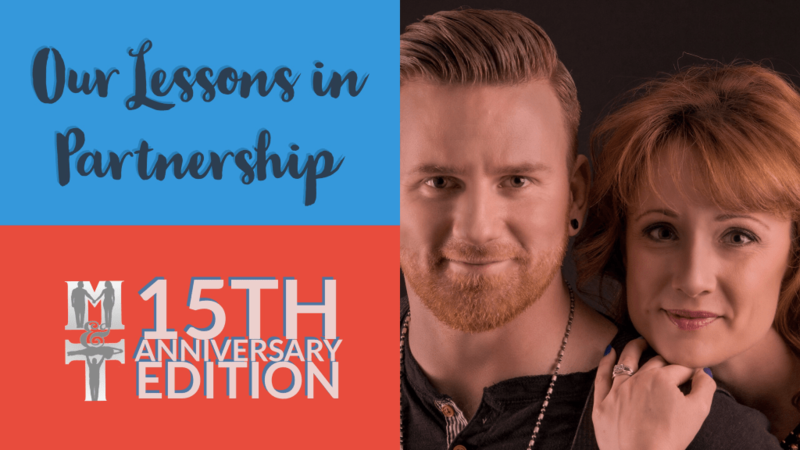 By requiring yourself to “be there” for your partner who is counting on you to hold your balance, hold you up, move you both, you become exponentially more aware of what your social dance partners need from you, and more responsive to the variables. 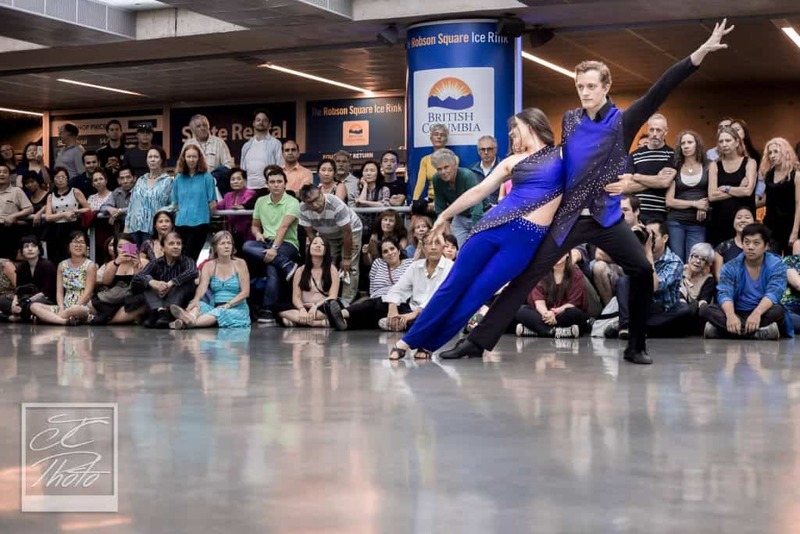 Unlike Salsa or Lindy Hop which regularly offer students the opportunity to join a team and learn the dance through choreography, West Coast Swing classes are focused on the improvisation skills. 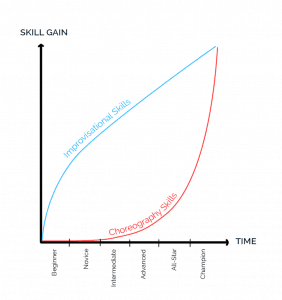 Which means that those who would like to learn choreography and/or performance skills have fewer options. Teams are uncommon to find and can be inconsistent – it’s hard to get everyone wrangled, even though everyone agrees its amazing when they all come together. While independent teams are the norm, a new concept created by Jordan & Tatiana has been gaining popularity over the last few years. 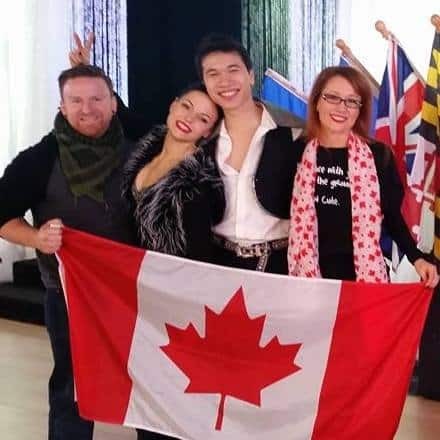 JT Swing Teams provides 2 levels of seasonal choreography to all “franchised teams” globally, so members can practice/perform with any group at various events they travel to. These involve a student dancing with their teacher to a routine choreographed by that teacher or a higher level Pro. This can be either for learning purposes to give focus to regular private lessons, or to compete in Pro-Am routine divisions at event. Unfortunately, the Pro-Am arrangement is not global, and is only common at events in the eastern and southern US, but this is slowly changing. This is a routine division for those wanting to perform a routine but do not want or need to compete against top pros. This is the perfect goal for up-an-coming competitive dancers who may be starting to teach and develop their career, or for those who are aiming to compete in Showcase or Classic eventually but want to “get their feet wet” in a lower-pressure environment. The Rising Star Tour is a network of events that offer the same standards of competition rules and awards. Each couple earns points every time they dance. At the end of the Tour, the couples with the top 5 highest point scores win massive prize packages including event passes, coaching from Pros, and tour winner jackets. Join the Facebook group: WCS Rising Star Support Network. If you have been dancing WCS for while and can do all your basics with your eyes closed and one hand tied behind your back, you’ll be fine. Your basics need to be at a point where they are automatic, because you’re going to be asked to think about a whole new set of movements & rhythms which will challenge your brain and body. That being said, by “basics”, I mean more than just patterns and footwork. Do you anchor and stretch consistently? Are you committed to your timing? Are you starting to hear the music differently than you used to? Also consider what your regular instructor(s) are telling you. Have you gotten feedback in your private lessons that you are ready for a challenge? It might be tempting to want to jump in to performance opportunities such as the flashmob/rally – it does look like fun! But here’s the caveat: rally choreography is a terrible way to learn WCS. It’s not meant for beginners. It’s meant to be a challenge for those whose basics are stable. 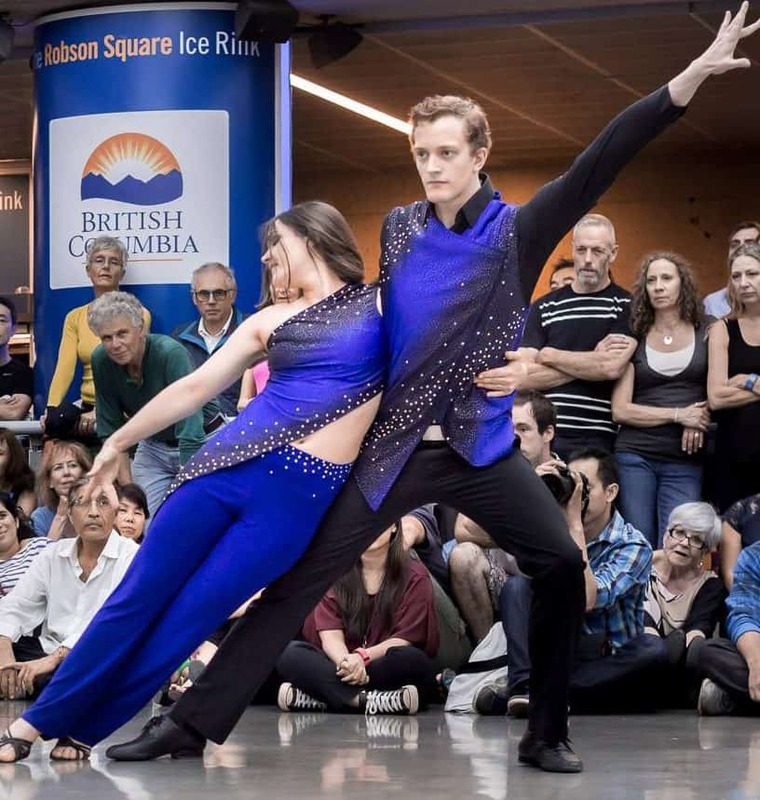 In fact, I have heard several dancers report that learning choreography before they were stable actually stunted their growth in their social dancing skills. We have seen new dancers completely defeated and burnt out of WCS because they were demoralized by trying to keep up with choreography that they did not have the skills to do properly. We recommend employing some mature delayed gratification: don’t rush in, listen to the advice of your teachers, and use the rally as a goal to strive towards. It will still be there in a few months or next year when your skills are ready for it. Choreography does not need to be limited to the professionals. Social dancers can feel free to demonstrate WCS to get exposure for the dance and to attract new people to it. Of course, the more public the audience, the more accurate the dancing should be, which means only higher level dancers should be demonstrating. Just because your dancing FEELS good to you, doesn’t mean you have yet attained a level of dance that is ATTRACTive to a spectator, meaning, able to attract interest to the dance. Consider your lifestyle right now. Do you have several hours a week to dedicate to practicing? Do you have access to a studio? Are you physically fit enough? Are you able to focus undistracted on your partner, or is life overwhelming you right now? Do you have the finances to afford costumes, coaching, and traveling to comps? If all these pieces aren’t in place, the process is going to be more frustrating than rewarding. 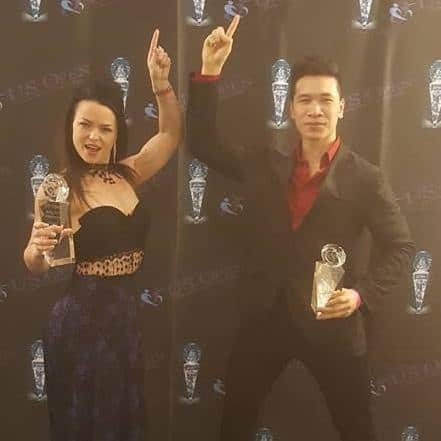 If your dancing has stabilized, is aesthetically pleasing, and you are conscientious about improving your dancing through private lessons, competitions, live and video feedback, etc, then you are ready for a new challenge. Pattern Math: Making 6’s and 8’s and alternate length patterns fit like Tetris into each phrase. Lyrical Learning: Listening to the rhythm of the vocals, versus the instruments or backbeat. Lyrical vs Rhythmic: Switching between moving on the beat to moving with the vocals or other instruments. Everyone wants a partner that’s a little better than them. But think about it – it’s statistically impossible. So settle for finding a partner that is a close match to your skill level, but more importantly a closer match to your attitude, commitment, location, and goals. Think about who you social dance with the best in your community. If necessary, look outside your city to the people you dance well with at conventions. Commuting a few hours for extended practices is more common than you think. 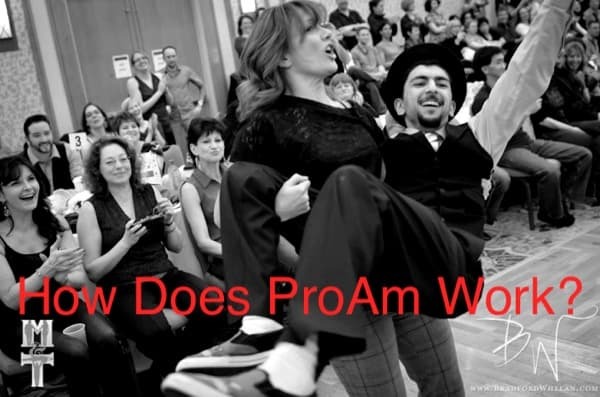 Or, consider ProAm until you find the right partner. Once you find a partner, it’s time to discuss your goals for the year ahead. Do you want to be competitive? In NASDE Classic or Showcase division? Are you wanting to aim for Rising Star? Masters? Sophisticated? When would you like to debut the routine? Give yourself at least 4-6 months lead time. Aim to perform your routine at a smaller function a few weeks before your goal debut, in order to “break it in” and have time to get the kinks out. Discuss a practice schedule that will put you on track to achieving these goals. This is such a tricky thing, even Pros can’t nail it consistently. Choose your genre – Fast Blues, Slow Blues, Contemporary, Classic R&B, etc. Start making a short list of interesting songs that fall within a tempo of 90-120 bpm. To be conservative, aim for the 100 bpm mark. Don’t be fooled by a super slow song just because you like late night social dancing to it. Slower songs are harder – not a good choice when you’re first starting out. Keep in mind songs can be slowed down or sped up slightly, and can be cut & pasted to offer just the right length and balance. Your choreographer most likely will cut your music for you. A good routine song is dynamic, not too repetitive. Many awesome late night songs are quite repetitive, so don’t be fooled. Look for a big distinction between the choruses and verses, and make sure they are balanced – not too many choruses back to back. Imagine you are making a salad – all lettuce and tomato is really boring. A performance piece requires a variety of interesting ingredients. Check the lyrical content for overt sexual references and foul language. 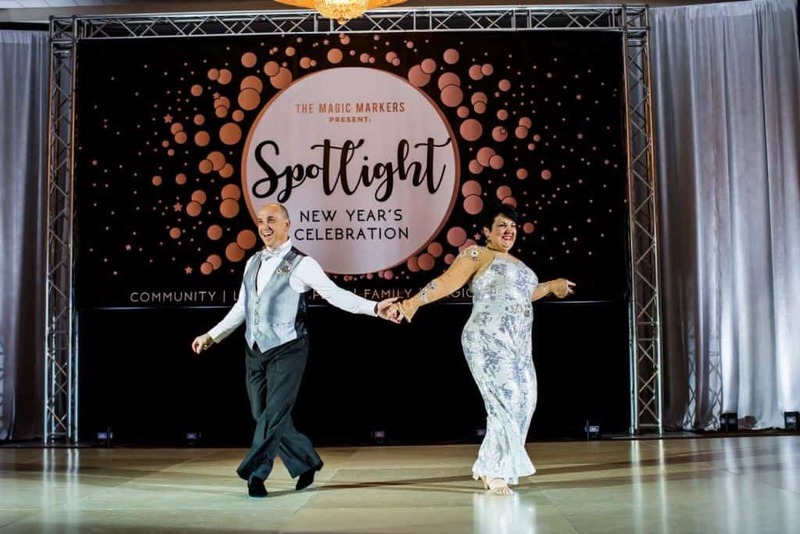 When you have narrowed your short list down to about 3-5 songs, try social dancing to each one with your partner and see which one inspires you the most. Then give your 1st, 2nd and 3rd choices to your choreographer to have the final say. This will be the bane of your existence. Frustration is inevitable, so don’t take it as a sign to quit. Schedule practices that are at least 2 hours. Arrive warmed up, and with a positive attitude. Bring water and snacks, so you have lots of energy. Prepare several edited versions of your song that are slower than the original. Every couple practices differently. You might try walking alone through the routine first, then alone with music, then with your partner sans music. Take each major pattern or phrase and repeat it over and over with and without music before moving on to the next section. Be very careful how you speak to your partner. Take care to discuss conflicting ideas or needs with sensitivity and maturity. When things aren’t working, focus on the fixing problems in the dance, not in your partner. Acknowledge your partner for their contributions and efforts. Notice when fatigue is clouding your judgement and affecting your performance. End the practice session then. Remember “practice doesn’t make perfect” – “practice makes permanent”. So if you practice crap, you’ll be reinforcing crap. 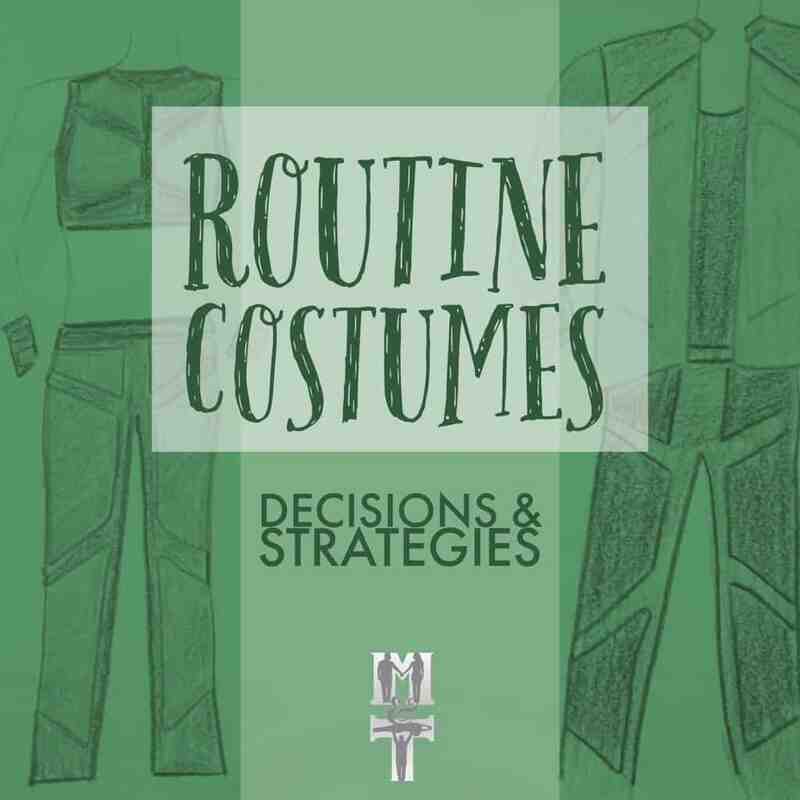 A professional choreographer will be able to design something that maintains your personal style, but also sticks to WCS rules, expectations, and character of dance. You might think that you are up for the challenge, but the learning curve for choreography skills is very different from the learning curve of your improvisation skills (see image). They have leagues of experience more than you, which will make their product more complete and the process more efficient. After your choreographer has completed your choreography, it is only the beginning. Learn the choreo as-is, but if there are moves you can’t do or that don’t fit on your bodies, don’t force it: get coaching. You can either get follow-up coaching from your choreographer OR choose another teacher to coach you. Coaching is a separate skill from choreographing, so teachers will likely have different strengths you can take advantage of. In coaching sessions, you will focus on smoothing out the rough edges, customizing movements so they fit your bodies better, and polishing the finer details. Try to get as much coaching as you can afford, with a minimum of 10 hours of practice time in between lessons. Feel free to use a variety of coaches to get different perspectives, but be sure to choose coaches that are strong in the same genre. For example, don’t ask a coach whose strength is hip hop to help you with a lyrical routine. Lifts are not as elite as they appear! There is a variety of levels of lifting skills, so even beginners can try with safety precautions. The key thing is to get guidance. Don’t just copy stuff off of You Tube. At least get a lifts coach to give you a crash course and some recommendations for YouTube material that is appropriate for your level. Always warmup and stretch before practice, and when either of you starts to get tired, stop before you injure yourself. We occasionally offer our signature 3-hour LiftCraft Intensive at select events. If you would like one in your area, make a request to your local event director. Can’t wait to see you on the floor! Break a leg!